Happy Democracy day sweeties, how has your day been? Mine has been good, spent the day with family. We thank God. I was supposed to post this a week ago so that people would prepare well, but i've been thinking of ways to make it as fair as possible. I felt in my heart the need to motivate and 'ginga' a few people, people that really want to lose some weight. Please see this as a small contribution of mine. Here goes; lets do a one month weight loss challenge where the person that sheds more weight gets a price. Actually the top 2 people will get prices. 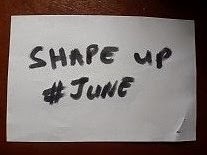 Its called : "SHAPE UP #june challenge". It will start on the 1st of June and end on the 29th of June. I chose Sunday 29th for this so that those that work can have time to take their closing pics and send them in. 2. 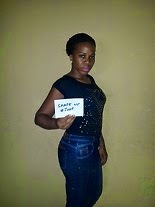 Stand on a scale and snap your starting weight, also make sure the 'shape up' card is captured with it. 3. Please send in pics latest 9pm on Sunday 1st of June. At the end of the challenge, take the pics as you did in the beginning and send to my email. Pics must be sent in latest 9pm on Sunday 29th of June. Go shopping for your food items and all that you need to eat healthy this period. DO NOT starve yourself so that weight loss can be maximized. Have a cheat meal once a week and make it a very small portion of whatever. Remember that this is a total lifestyle change, take it nice and easy. Sorry this is pretty late, but i believe that you are ready when you are ready. So are you guys interested? No Ojoro o (cheating), remember that 'dia ris God oooo!!!' Lol! You have 2 days to prepare for this, so make up your mind and lets get cracking! All the best and God bless you. N.B: I have taken down all the meal plans on the blog for obvious reasons. They have been up for over a year. I don try na. Man must chop. hahaha! Please contact me for details on how to get a new and upgraded meal plan. Fees apply :) See list on the top left corner of the blog. Disclaimer: Please know that if you decide to take part in this challenge, you do so at your own risk. Cheliz will not be held accountable for any mishap (i reject any though). I do this out of love. Thanks. Hi, I want to join your challenge. However I'm not on instagram, Facebook or twitter. I also live outside Nigeria, so I guess my only prize will be to loose some weight. You can still join the challenge dear, its mainly a motivation for u to start losing weight. Take care. So am outside the country and I so want to lose weight..I weigh 77kg right now and my goal is 58kg.So am joining the challenge,I hope am not on my own. Sure u can join Ibukun. Just that if you win, u can donate ur dvd price to anyone in naija since I wont be able to send it to u, but I can mail the meal plan to u. All d best dear. Dont forget to send In ur full pic and weight pic. Thanks. Every day I lie in bed and read your blog. I'm ginger ed, I'm inspired yet all I do is lie down and read, and exercise in my mind...hahaha. God help me. Then I saw this challenge and I'm like yeah, finally, a motivation, then my mind says Wetin u wan take cd do, u Don finish d ones for house...my case is pathetic, I'm currently 110. I cant stop laughing. This is a serious case we have here. Hope we wont have to fast for 21 days on this case? My dear make up ur mind fast. Do it like ur life depends on it. Cd or no cd. Take care. I go girl! Thats the spirit! No expo oo lol! Just eat right and exercise. Take things easy tho and no starving o. All the best dear. @ Cheliz. Don't worry if I win, keep my package. I go pay 4 my delivery lol. 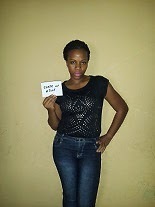 Anuli my sure babe! I know ur ready for this. I love ur energy. Keep it up. No probs dear. No probs dear u can still join in. But the dvd and meal plan r the gifts for the 2 winners. The meal plan is a fat loss meal plan. You put in ur best and see how far you can go. Eat clean and exercise. Take care. Cheliz d whole of me wants to participate but half of me is skeptical cos my weight has refused to shift. All d same am game let's see whether God will answer my prayers. I have been eyeing 70kg but my bulk has refused to shift from 78-79kg. The situation is critical ooo. However, am in but I need special monitoring from you. Zeebaby u can do this. Now its a game on! 78kg must shift by fire by force! Lol. All the best dear. Hi Fina. Yes this is oyo o. It will help you understand your body. Its a challenge and a start for those that want to make a change. Maybe I can help with exercises tho. Lets see. All the best. Hello Cheliz, i'm new ut ve read a couple of ur posts. Quite impressed by u.
I'm taking d challenge. I pray for strength n grace as I really need it. I'm abt 92kg n i'm targeting 70kg in d long run (as my eventual reg weight). Hi Tess. Ur on right on time then. Time to shed unwanted fat. Lol. More grace to u. Thanks and take care. Hi dear. Pls read up on this post. U'll find all the info you need. Take care dearie. My Dear, 110kg partner. Let's work together on this ooo. We need to motivate each other.